Catalyzing Change in High School Mathematics: Initiating Critical Conversations identifies and addresses critical challenges in high school mathematics to ensure that each and every student has the mathematical experiences necessary for his or her future personal and professional success. This session provides an overview of Catalyzing Change and initiates critical conversations centering on the following serious challenges: explicitly broadening the purposes for teaching high school mathematics beyond a focus on college and career readiness; dismantling structural obstacles that stand in the way of mathematics working for each and every student; implementing equitable instructional practices; identifying Essential Concepts that all high school students should learn and understand at a deep level; and organizing the high school curriculum around these Essential Concepts in order to support students’ future personal and professional goals. Catalyzing Change is written to engage all individuals with a stake in high school mathematics in the serious conversations that must take place to bring about and give support to necessary changes in high school mathematics. Take a look at pieces of Geoff Krall’s book on Secondary Math. He’ll share the inspirations for the book as well as a framework for pedagogy for secondary math teachers. You’ll see excerpts from the book as well as printables to advance your practice. 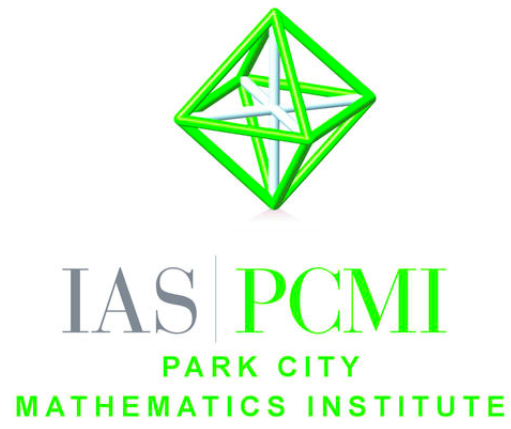 An intensive, three-week residential program, the PCMI/TLP provides participating middle and high school math teachers with the unique opportunity to engage in a deep dive into their own professional development, alongside parallel communities from across the larger umbrella of mathematics profession. In addition to doing math, reflecting on practice, and developing capacity as a teacher leader, both formal and informal interactions connect teachers to research mathematicians, mathematics university faculty, undergraduate & graduate students, and thought leaders addressing equity in mathematics education at the post-secondary level. Join Cal Armstrong (@sig225), Peg Cagle (@pegcagle), and Dylan Kane (@dylanpkane) to learn about this unique professional development offering, in time to meet the summer application deadline of January 15, 2019. Working mathematically is about more than knowing facts, recalling definitions and applying techniques to familiar problems. I teach a course at the University of South Australia to develop problem-solving skills in pre-service maths teachers (primary and middle school). We focus on mathematical processes, not any particular branch of mathematics. We learn and practice strategies for: getting started, attacking the problem, and reflecting on and extending our work. The aims are to: develop students’ mathematical thinking skills so that they can tackle unfamiliar problems with confidence, help them experience the joy in asking and answering their own questions, and orient them towards the ways in which mathematicians work. In this session we’ll sample some good problems for uncovering aspects of problem-solving, and talk about specific strategies for progressively developing oral presentation and mathematical writing skills. We’ll also tackle the thorny issue of assessment, including how to support students to undertake in-depth mathematical investigations of their own choosing. My goal is that you’ll find one or two specific ideas that will help in your current teaching. Catalyzing Change in High School Mathematics: Initiating Critical Conversations identifies and addresses critical challenges in high school mathematics to ensure that each and every student has the mathematical experiences necessary for his or her future personal and professional success. This session provides an overview of Catalyzing Change and initiates critical conversations centering on the following serious challenges: explicitly broadening the purposes for teaching high school mathematics beyond a focus on college and career readiness; dismantling structural obstacles that stand in the way of mathematics working for each and every student; implementing equitable instructional practices; identifying Essential Concepts that all high school students should learn and understand at a deep level; and organizing the high school curriculum around these Essential Concepts in order to support students’ future personal and professional goals. Catalyzing Changeis written to engage all individuals with a stake in high school mathematics in the serious conversations that must take place to bring about and give support to necessary changes in high school mathematics. To join this meeting when it starts at 9pm Eastern (or RSVP if it’s before 9pm), click here. 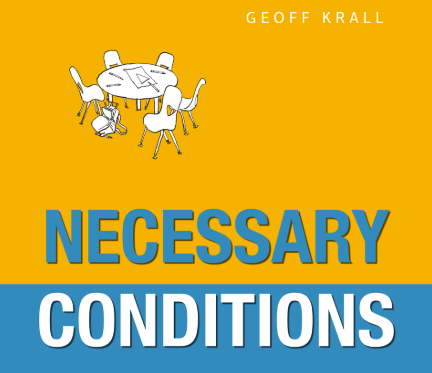 Last week Geoff Krall presented a webinar focusing on his new book, Necessary Conditions. If you missed it, make sure to catch the recording! Don’t forget – recordings for all previously held webinars can be found here. Please note, the Global Math Department will be taking a 2 week holiday break from both webinars and newsletters. We will see you in the new year on Tuesday, January 8, 2019! Happy holidays to you and yours. Build positive relationships, get to know your students, show personal interest in your students lives. I’ve heard these suggestions often. And indeed, I think these are fine suggestions, but they only go part way. They are just a bit vague and seem incomplete. I feel they need a bit more focus and sincerity or they risk being empty platitudes. On Tuesday evening, I participated in Geoff Krall’s Global Math Department webinar (check out the recording at Big Marker) highlighting themes from his recent book Necessary Conditions: Ingredients for Successful Math Classrooms. One part that really resonated with me was when he talked about the difference between Passive Caring and Active Caring and shared the table below. I feel like in the past I have too often displayed passive caring to my students. I haven’t worked hard enough to reach out to every student. Geoff recently wrote to his blog some additional details about enacting Active Caring. He tackles the question of how to find time to accomplish these active caring strategies in the classroom and makes some practical suggestions. Many schools will soon be taking a holiday break and returning in January. As you return to classes in the new year, think about how you might demonstrate active caring with your students (you might even consider it a new year resolution). How will you be intentional about incorporating this? Her most recent post, On Fidelity, seeks to explain the importance of translanguaging and all its nuances. Although I had a basic knowledge of it, Cristina, a trilingual herself, patiently explained the answers to some of my questions. This post offers so much more. Translanguaging is the idea that bilinguals are not two monolinguals trapped in one brain. It acknowledges the richness of our lived experiences and that multilinguals should have opportunities to use their full linguistic repertoire. Translanguaging does not believe in siloing languages. Although it does recognize that sometimes one language may need to be protected from being overtaken by a “language of power”. Her blog post begins with her description of her journey as a student in a monolingual world. She then describes how the embrace of translanguaging has evolved in her life and teaching of students and leading professional development. She gives us a new view of what is possible when we let go of our assumptions and our allegiance to conventional views of teaching and learning. As I read her piece, so many thoughts emerged related to student and educator identity, and how it shapes our learning and teaching experiences. Cristina offers us quite a bit to chew on here, and I look forward to her continued writing. Full disclosure: I’m extremely partial to estimation in the math class. Back in April of 2018, Steve Wyborney posted a wonderful series of 40 estimation lessons under the name “Estimation Clipboard.” The estimation lessons include 4 highly similar images that allow students to estimate based on additional information and context with each image. There are plenty of opportunities for students and teachers to have rich mathematical conversations. In addition to the free 40 estimation lessons, Steve offers facilitation tips to help you get started. Be sure to head over to Steve Wyborney’s blog and begin estimating. Copyright © 2018 Global Math Department, All rights reserved. To join us at 9:00 PM EST for this webinar click here! Next week at Global Math NCTM President Robert Barry will be here with an overview of “Catalyzing Change in High School Mathematics: Initiating Critical Conversations.” You can register ahead of time here! 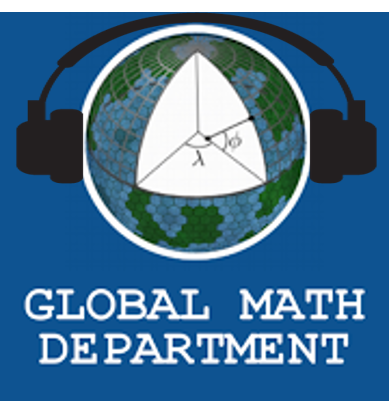 You can always check out past Global Math Department webinars. Click here for the archives or get the webinars in podcast form! The Year Progress Twitter account is amusing. It only tweets an old-fashioned looking “loading” bar showing, well, the progress of the year towards the end. It may well be that you feel like “Teacher New Year” (for many, people, the day after Labor Day is the “real” New Year) was yesterday, and you have barely made progress in reaching your goals. I assure you, you have. That bone weary feeling you have right now means that you have worked hard, and need a rest. Take some time to pause, reflect, and think on what goals you have for the “other” New Year. Humans love patterns, we are good at perceiving them, and we love the sweet feeling of “starting over”. If 2019 is a blank slate, what do you want to accomplish? What goals will you continue to work towards? Is there anything new you want to try? It could be a time for new habits, new goals. I recently read “The Power of Habit”, and it powerfully describes how, set in our ways though we often are, we have the power to change our habits. Be kind to yourself though – maybe pick one good goal for yourself in your practice, and find the steps you will need to take to achieve that goal. All best wishes for the holiday break, Merry Christmas to those who celebrate, and Happy New Year! 2019 will be great! 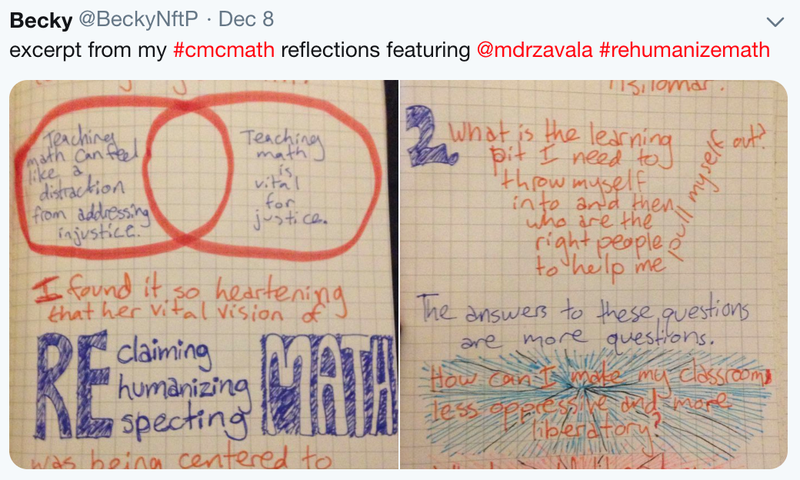 I was fortunate enough to attend CMC-North Math conference at the beginning of December. I saw Howie Hua playing piano in the lodge. He has shifted my teaching with small transformations toward a more humanitarian classroom. One thing that gets lots of attention is his method of allowing students some processing time before a test. This, being my first year at High School (giving finals), I saw students respond with positivity when I allowed them time to prepare a “one page” prior to the exam. Given that we have block periods (and it is against most progressive research to ask kids to sit for two hours), I had them take a “one rule” break mid-exam. Flip there tests upside down, take your one page, STAND-UP and collaborate to add more to your notes. There was active discussion; and the process of a “final exam” felt more humane. Adding to this theme; I was fortunate enough to attend a talk by @BeckyNftP titled: “Warm up to Mathematical Freedom.” She landed on this idea from an aside in Jo Boaler’s talk last year and has since been grappling with the meaning. This question posing session had me considering my “tent poles” or the structures that support the rest of your teaching practice. When have we felt “mathematically free”? When do our students feel free? Should we consider as Jo Boaler says both Organizational and Mathematical freedom? Should we lean toward Tracy Zager’s ideas of Mathematicians as Rebels? Next topic: Teaching is a Political Act; follow @BadAssTeachersA to keep up to date and enter into the realm. If you are fortunate enough to be at a school with a teacher’s union; show up for their events: everyone benefits when public schools thrive. GMD is Looking for Presenters! Do you know someone who you think should lead a GMD Webinar? Did you see something amazing at a recent conference that needs to be shared? At Global Math we are proud of our Webinars! We appreciate all of our presenters and look forward to bringing you the best “PD Iin Your Pajamas” on the internet. We’re always on the lookout for fresh faces and new ideas. Please use this recommendation form to let us know who/what should be shared next! We will take your recommendations and reach out to try to make it happen! Next week at Global Math Geoff Krall will be sharing ideas from his new book Necessary Conditions. You can register ahead of time here! David Wees recently wrote a blog post called “Teach Better By Doing Less.” In this post he talks about the “two common activities teachers do that have either little to no impact on student learning but which do take teachers a tremendous amount of time, time that could be spent on other activities.” One of these activities is grading student work. In the post, David quoted Dylan Wiliam when he talks about how his work in schools has shown that students only focus on the number grade and mostly fail to read or process the teachers comments. So David’s point is that teachers should still look at student work, but that it should be used to plan future lessons. His tweet is quoting Henri Picciotto who also wrote a blog post called “More Catchphrases.” In this post he talks about budgeting your time and not grading more than you need to. So what are your strategies for grading less? How do you make sure you are giving students feedback that is meaningful, yet isn’t too time consuming? Anyone trying to go gradeless? I’d love to hear about it! I recently read Cornelius Minor’s new book, We Got This: Equity, Access, and the Quest to Be Who Our Students Need Us to Be, and it’s stuck with me for several reasons. For one, it’s a beautifully written and illustrated book, drawing on comic book art to add visual impact to Cornelius’s lyrical words. For another, it’s a powerful blend of the visionary and inspirational teacher book that makes me a) want to do better and b) feel like it’s possible; the concrete and practical resource with guided questions to help readers think through dilemmas and situations in their own classrooms, in addition to strategies and advice; and the deeply personal and vulnerable memoir of moments from his teaching experience where he didn’t do everything right, or where a student gave some very honest, very difficult feedback. It’s sitting in my mind as I visit classrooms this week and talk to teachers who know—like Cornelius—that they’re not going to single-handedly end racism or fix inequity, and who walk into their work every morning facing problems that cannot be solved by balancing both sides of the equation. Nonetheless, I feel like their classrooms are characterized by a lovely interaction of warmth, caring, and thoughtful mathematical instruction, and I’m curious how their students experience these classrooms. One thing these teachers and I have been talking about together has been giving a survey before winter break. In my experience, students are both astute observers and also very generous with their feedback, and creating the opportunity for students to share their perspective both honors their voice and invites them to practice reflection and metacognition—but only if what they say will be taken seriously (in the past, I have also seen teachers dismiss student feedback as biased or motivated by a grudge, in which case, why waste everyone’s time?). This makes me think that surveys should be accessible (will students know how to answer the types of questions you’re asking? ), concrete (questions that are too open-ended—”what do you think about this class?”—tend to lead to vague answers—”it’s great”), and focused only on what the teacher cares most about (if there’s no intention of actually changing a particular practice, why ask how they feel about it?). I happen to like questions like “tell me about a time when…” or “describe what it’s like to…” or “how does it make you feel when…” Maybe that’s self-evident, but I always find it easier said than done. Are you giving a student survey before winter break? What kinds of questions are you asking?